Carribber holiday cottages and Bowden Springs fishery are located in an idyllic setting on an elevated site over-looking the beautiful West Lothian countryside. The elevated position allows for wonderful views towards the Ochil and Trossach Hills. Situated only 20 miles from Scotland’s capital city, Edinburgh, Carribber holiday cottages enjoys a strategic location close to both the M9 and M8 motorway network. This provides easy access for visitors to reach the destination quickly and without undue hassle. Carribber is accessed just off the A706 approximately 3 miles west of the Royal Burgh of Linlithgow. After leaving the A706 the site is accessed via a narrow road leading up to a parking area in front of the cottages. The overall site amounts to circa 11.5 acres. A thriving holiday homes business comprising three high quality modern cottages. A well-established commercial fishery consisting of two former reservoirs, Bowden Loch circa 1.9 acres and Carribber Loch circa 5.1 acres. A 4 bedroom owner’s accommodation with garden. A fishing lodge incorporating a small shop, kitchen, seating area and car parking area. Full Planning Permission to create one more holiday cottage. Trading as two separate business this offers an opportunity to develop a lifestyle business on two fronts; firstly the holiday cottage trade and secondly the fishery trade. Both work hand in hand to provide a sound business proposition along with separate quality owner’s accommodation. 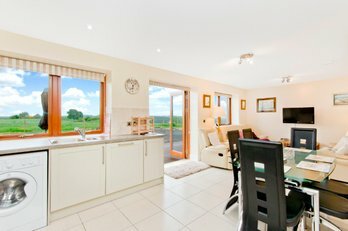 Carribber cottages have been trading for 3 seasons and are developing a reputation as quality holiday accommodation. The three cottages offer all year round trade and has an increasing volume of occupancy. Bowden Springs Fishery is a well-established commercial trout fishery and holiday cottage business in idyllic rural surroundings, situated only 20 miles from Edinburgh. Bowden Springs originates from 1910 when “Carribber Reservoir” supplied domestic water to the town of Bo’ness and the surrounding area. In 1965, the reservoir became surplus to requirements and is now an established trout fishery situated within the rolling hills of Bathgate, West Lothian. The fishery was first opened in 1979. It is notable for the fact that it is one of the few local fisheries in Scotland that allows fishing for trout with bait as well as fly. Anglers are attracted from a wide geographic area to enjoy what is a peaceful and secluded setting situated around two former reservoirs. There are 20 fishing stations and several casting platforms positioned at strategic locations around the two lochs. The two lochs are stocked with a mixture of rainbow and blue trout but are also supplemented by brown trout which breed in the feeder streams. * We understand the lochs are not covered by the Reservoirs (Scotland) Act 2011. Trading under the name ‘Carribber Cottages’ the business comprises a terrace of 3 cottages, which were created in 2015 through the redevelopment of a former outbuildings. The thriving business is proving to be a popular holiday retreat both for families looking to explore the surrounding area and also visitors to the fishery. There is a good level of repeat business and there is now an all year round occupancy although May through to October proves the most popular. Additional details on this element of the sale can be found on the website www.carribercottages.co.uk . Apart from their own dedicated website the cottages are marketing through the Homeaway and The travel chapter web sites which produce a good volume of occupiers’. Occupation can be for two days or more depending on the individual’s requirements. There is full planning permission to create one more holiday property comprising of a lounge/kitchen/diner, 2 bedrooms and 2 shower rooms. The planning reference is 0005/FUL/18. We understand there is a Section 75 planning agreement in respect of Carribber Cottages restricting the use of the properties for temporary habitation only. Along with the business there is a large owner’s house with a flexible two public room and four bedrooms configured over two levels with a mature garden overlooking the two lochs. The two businesses are set up as two separate trading entities. The turnover for the Carribber holiday cottages for the year ended April 2018 shows an increase from the previous trading year. The business is managed by a husband and wife team who live on site. The turnover for Bowden fishery for year ended 31 March 2018 is consistent with the previous year. This is again managed by the same husband and wife team as the holiday cottages. There is potential to further develop both businesses. The cottages have now been running for 3 seasons and are continuing to develop and increase in popularity. There is no doubt that with more target marketing and an increase in dedicated web site that business can further blossom. The fishery has the potential to attract more visitors with careful target marketing, the use of dedicated fishing web sites and by local clubs, schools etc. becoming re-acquainted with the fishery. Financial information regarding the trading businesses will only be provided to parties who have conducted a viewing and noted an interest. The properties are serviced with mains water and single-phase electricity. Waste drainage is collected by a septic tank. Heating in the owner’s accommodation is by Calor gas and the cottages are oil fired. Hot water in the owner’s accommodation is supplied by solar panels on the roof. According to the Scottish Assessors website, the subjects carry two separate entries on the Valuation Roll. The workshop has a Rateable Value of £1,400. The holiday cottages have a Rateable Value of £5.900. Viewing is strictly by appointment only through prior arrangement with the sole selling agent, IME Property. The property has been elected for VAT or not. A price is available on Application for the landholding, properties and goodwill of the businesses.